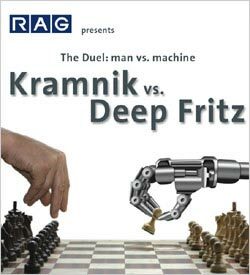 Yesterday was game one of the Vladimir Kramnik - Deep Fritz match-up. 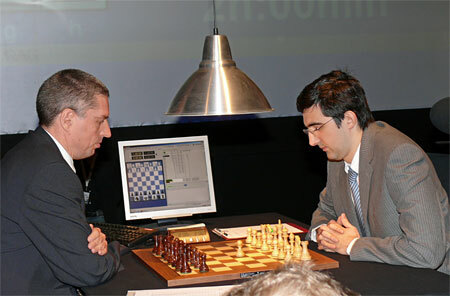 There are six games scheduled, with Kramnik looking to claim the million dollar prize. Game one ended in a draw after Deep Fritz defused the opening danger to reach a roughly equal endgame. Game two goes Monday. ...Kramnik settled for doubling Black's pawns and getting a tiny endgame edge that was more optical than real. Fritz played some unorthodox moves but never seemed in doubt of the eventual draw. An impressive control game by Kramnik, although it should be much harder to achieve with the black pieces on Wednesday.